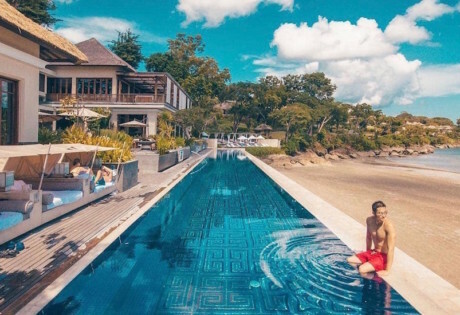 If you haven’t sprawled out beside a white sand beach with a designer cocktail in hand and your toes touching a glittering infinity pool – did you even holiday in Bali? 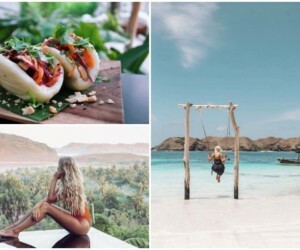 Whiling away a sunshiney day (and night) at one of the island’s best beach clubs is high priority on every Bali bucket-list, so we’ve cherry-picked 28 of the very best for your next island vacay – all you need to do is don your hottest bikini, turn up, tune out and lounge on…. Finns Beach Club, Jl Pantai Berawa, Canggu, p. +62 361 844 6327, e. info@finnsbeachclub.com. 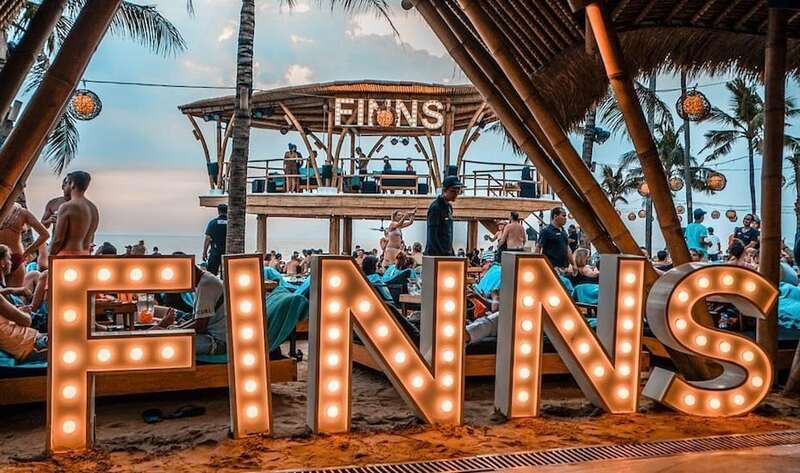 If you want to add even more glam to your day at the beach, Finns Beach Club (above) has its very own VIP destination for superstar sun-soaking. Sitting right next door to the main beach club, Finns VIP Beach Club is a superlative experience lavished in five-star facilities and celeb-style services, wrapped up in island-chic aesthetics that sprawl across acres of manicured estate. Like a tropical Utopia that blends the glitz and glam of St Tropez or Santorini, Finns VIP Beach Club is in a class all of its own, complete with a dedicated Champagne Bar, sunglass-cleaning services, a world-class spa, gourmet picnic area and even a wholly private Penthouse to up the elite stakes even further. 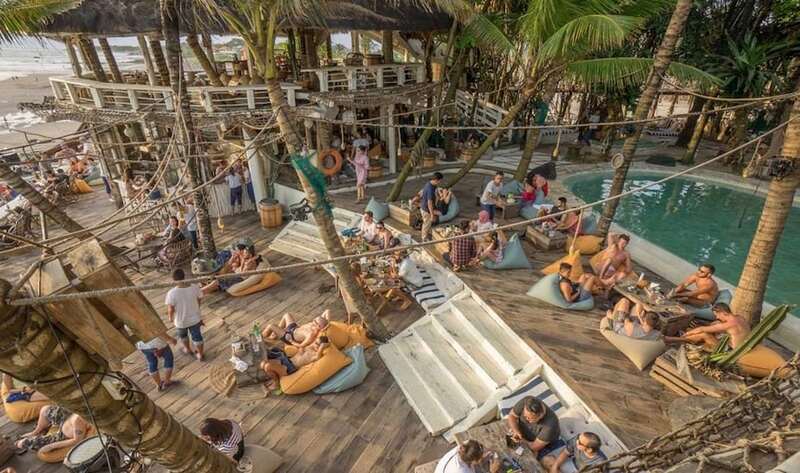 This is the bee’s knees of Bali’s beach clubbing scene. Finns VIP Beach Club, Jl Pantai Berawa, Canggu, p. +62 361 844 6327, e. info@finnsbeachclub.com. Sundays Beach Club, Jl Pantai Selatan Gau, Banjar Wijaya Kusuma, Ungasan, p. +62 361 848 2111, e . hello@sundaysbeachclub.com. Tropicola is a utopian invention from the unstoppable squad that gave us Motel Mexicola! 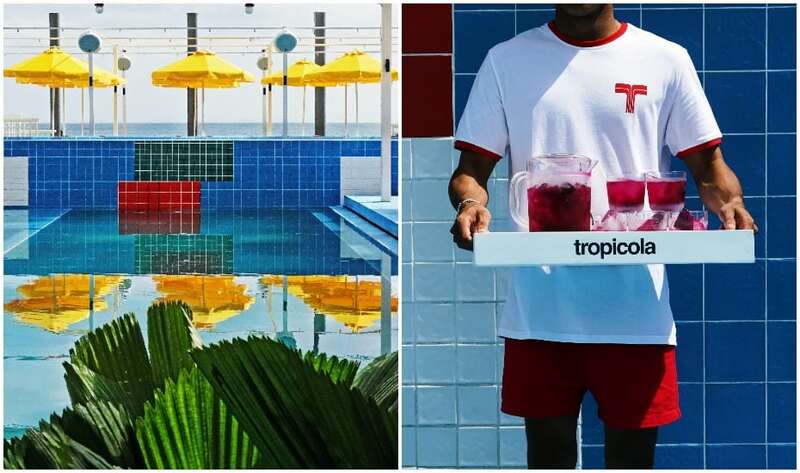 Picture this: Palm trees sway, piña coladas flow and flamingo-print shirts bounce from pool, to beach, to the bar and back again. Coconut oil melts in the sun, shellfish sizzles on an open fire, and the sounds of splashing, chatting and toes tapping reverberate against the sea. Sound like tropical heaven? You’re not wrong. This is Tropicola, the utopian invention from the unstoppable squad that gave us Motel Mexicola. It sits on a whopping 7000 square-metre expanse of beachfront hedonism, with three bars across multiple levels, two giant pools, a wood-fired open kitchen slinging some of the best beachy bites around, and of course, more cocktail-sipping, sun-soaking spots than you can shake a sarong at – all on Seminyak’s seemingly endless stretch of golden sand. 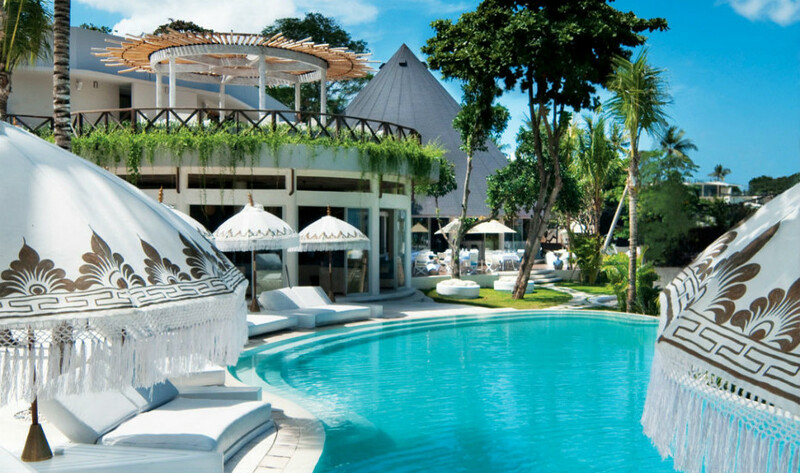 This is one Bali beach club you need to know about. Tropicola Beach Club, Jl Pantai Batu Belig No.5, Seminyak, e. info@tropicola.info. Open daily 11am – midnight. 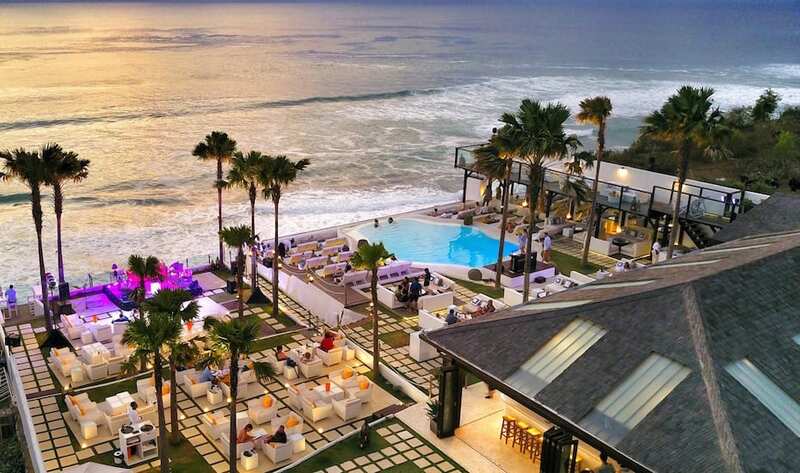 Potato Head Beach Club, Jl Petitenget No 51B, Seminyak, p. +62 361 473 7979, e. phbc.reservation@pttfamily.com. Celeb-like lounging, world-class cocktails and million-dollar views? Yes please OMNIA Dayclub! 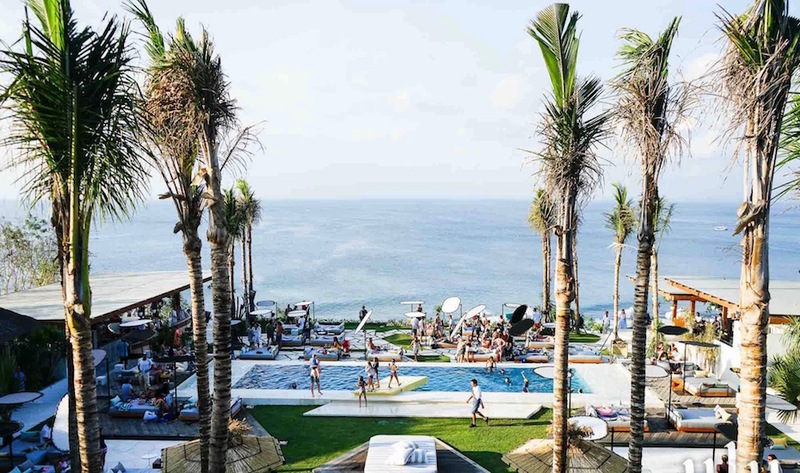 It’s chic, exciting and unlike anything else on the island – OMNIA Dayclub is Uluwatu’s sky-high destination that’s shining an international light on Bali’s luxury lifestyle scene. This sky-high playground is chock full of celeb-like lounging spots, jaw-dropping designs, fabulous cocktails, and of course, million-dollar views. And, with the internationally-acclaimed Hakkasan Group behind it, you can also expect good vibrations from superstar DJs, and award-winning cuisine from the dayclub’s stunning Sake no Hana restaurant. OMNIA Dayclub Bali, Jl Belimbing Sari, Banjar Tambiyak Desa, Uluwatu, p. +62 361 8482 150, e. reservationsbali@sakenohana.com. One of the true Bali originals, Ku De Ta continues to wow the crowds by always staying one step ahead of the pack. Simple, tasteful and elegant (with just enough daytime-party vibes), this famous beach club and restaurant is quite simply unmissable. Eat brekkie or brunch like a boss by the beach, graze away the arvo by their oceanfront infinity pool, or settle in for a romantic dinner at the swish downstairs decking restaurant. For one of the hottest tables in town, head upstairs to their cutting edge degustation kitchen, Mejekawi, for a next level dining experience. Ku De Ta, Jl Kayu Aya No. 9, Seminyak, p. +62 361 736 969, e. reservations@kudeta.com. Manarai Beach House is a panoramic palette of paradise in fifty shades of blue! 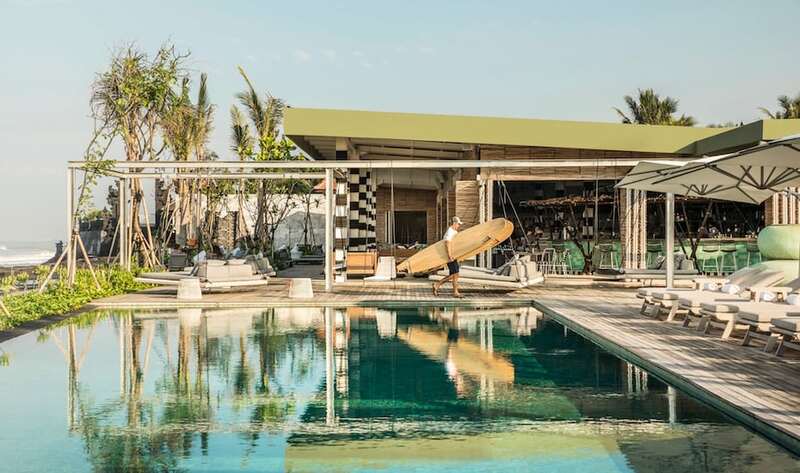 If beachfront cocktails and shabby-chic tropical vibes sounds like your kinda jam, then turn up and chill out at La Brisa – Canggu’s boho-beanbag beach club on Echo Beach. From the same family as Laguna, Favela, Sicilia and Plancha, La Brisa brings more of the same ramshackle cool that helped make all the others such roaring successes. Gorgeously casual with a chic edge (we love those reclaimed-wood deck chairs! ), we’re stoked to say that none of the castaway island charm has been lost at La Brisa. Think rustic Spanish cooking, delish cocktails, swaying palm trees and a hot soundtrack to complement a lazy day in paradise. Do you dare to dip at Oneeighty?! With views like this, you’ve gotta! 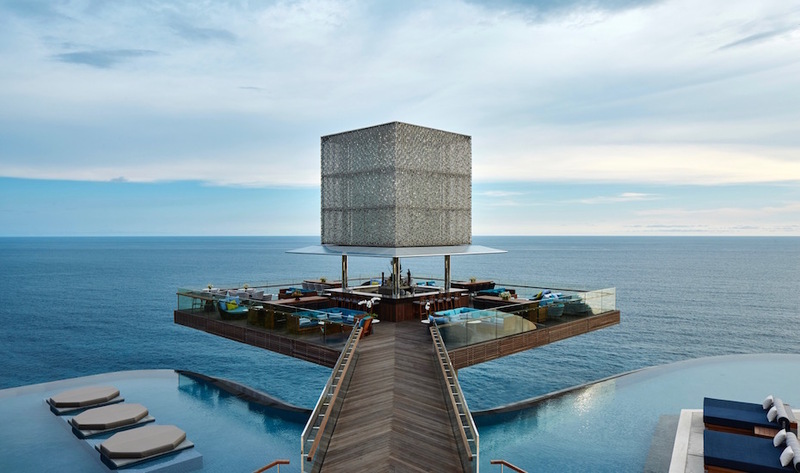 Home to one of the world’s most jaw-dropping infinity pools, the Oneeighty cliff club at The Edge has to be seen to be believed. Not for the faint-hearted, swim out to the end and look down through the glass to the crashing Indian Ocean hundreds of feet below while sipping on your carefully crafted cocktail from the all-star mixologist team. Relax on the cliff-side VIP deck, recline on a sunbed in the sand lounge or take a table at the enclosed bar, where you can sample classic upmarket beachside fare. By night, the mood changes and Oneeighty transforms into a tranquil oasis, complete with a chilled soundtrack, fire pits and uplit coconut palms. Heaven! 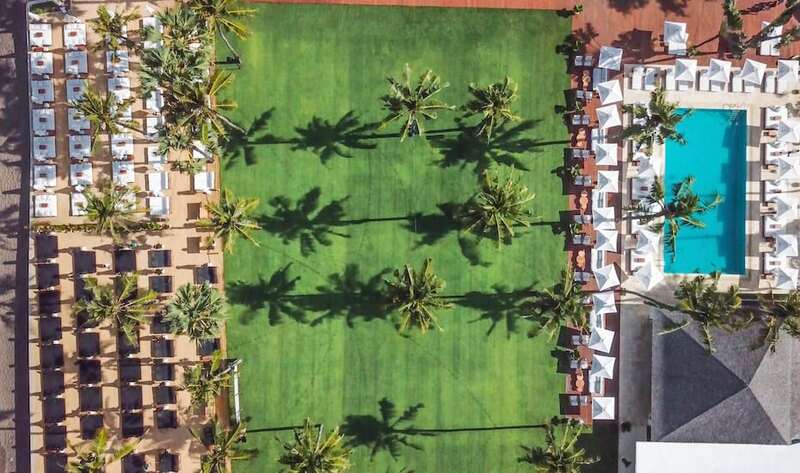 The grass really is greener at The Lawn in Canggu! 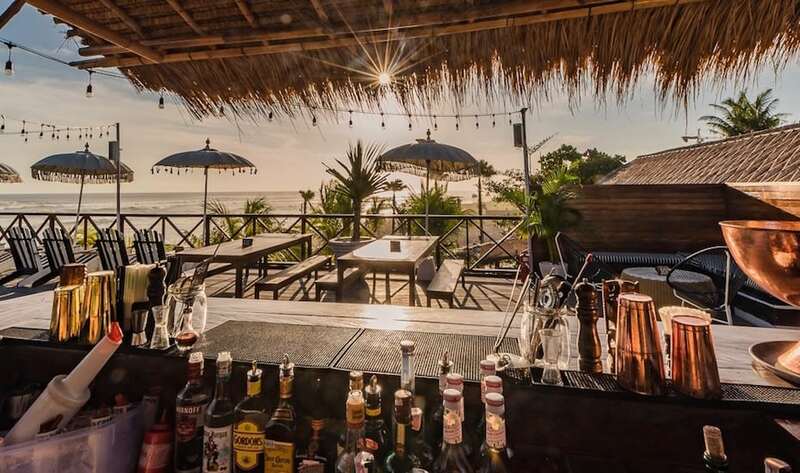 Stylish cocktails, gourmet bites and a backyard beanbag setup mean that this happening spot on Batu Bolong Beach is a firm favourite when it comes to Canggu’s ever-growing beach club scene. With its commanding views overlooking the waves and one of the best sunset sites in town, the grass really is greener at The Lawn. There’s an ocean-front pool, beach-chic daybeds with boho umbrellas, and crowds of beautiful people lapping up the sunshine and good island vibes. Swing by on a Friday night for half-off drinks and one of the biggest weekend parties in town. 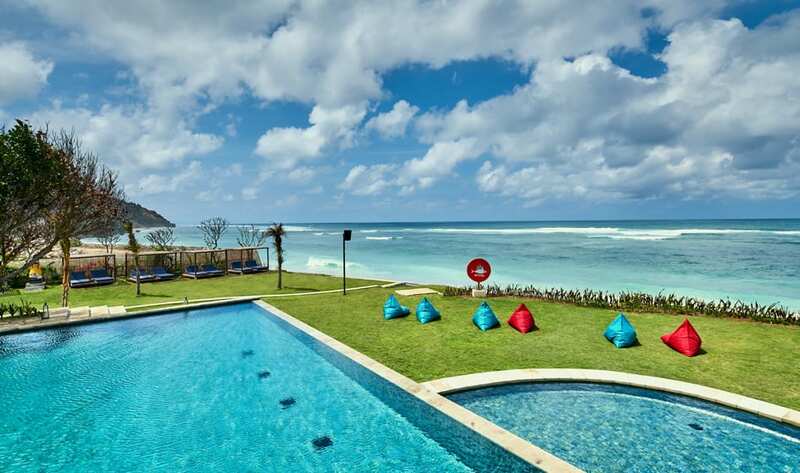 The Lawn, Jl Pura Dalem, Canggu, p. +62 361 335 1055, e. hello@thelawncanggu.com. Located on the white-sand sweep of Jimbaran Bay, this elegant beach club and restaurant really nails the luxe ocean vibe. 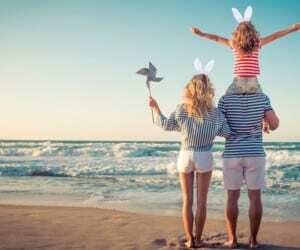 Offload the offspring at the kid’s club and lounge the afternoon away on one of the double day beds while getting your bronze on beside the 57-metre infinity pool. By night, pull up a sofa by the fire pit and enjoy Bali’s classiest cocktail list while soaking up the dreamy ambiance. Snack and graze off the casual menu, or if you’re feeling romantic, the main restaurant area is an absolute date night hit thanks to the posh Pan-Asian style cuisine and five-star service. Sundara at Four Seasons Resort Bali at Jimbaran Bay, Jimbaran, p. +62 361 701 010, e. sundara.bali@fourseasons.com. Worth the trip over to Nusa Lembongan solely to hang out at this secluded beach club (they have their own private bay for goodness sake!) Sandy Bay is an absolute must visit. Sandy toes, sea breezes and the crashing blue ocean all add up to a setting that borders on dreamlike. Kick back by the cute infinity pool or find yourself a casual table to nibble on some of their fantastic beachy fare (the stacked Veggie Burger with a Bloody Mary is next level!). Then, come sundown, there’s no better spot on the island to catch the show with an Islander Pimms in hand, natch. Sandy Bay Beach Club, Sandy Bay Beachfront Estate, Sunset Beach, Nusa Lembongan, p. +62 813 3757 0624 / +62 878 6227 4780, e. beachclub@sandybaylembongan.com. 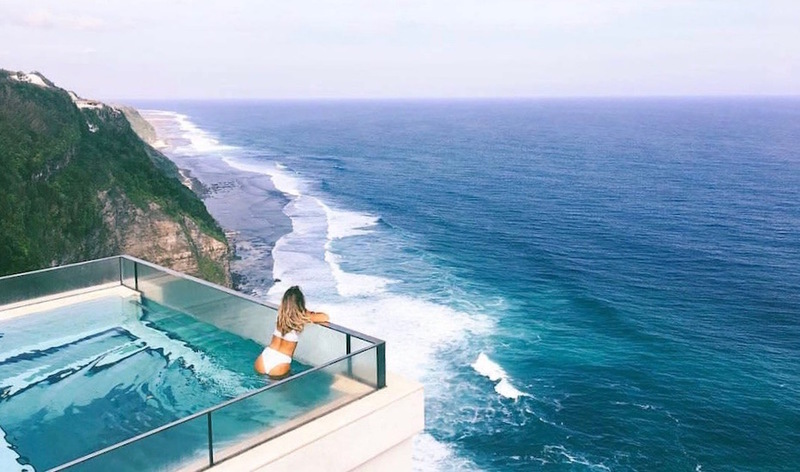 Ulu Cliffhouse has quite literally elevated Bali’s beach club scene – and we can’t get enough! Hovering high up on Bali’s Bukit peninsula, Ulu Cliffhouse has (quite literally) elevated the island’s beach club scene to giddy new heights. The unreal views across the deep blue Indian Ocean are pretty darn breathtaking, enhanced perfectly by a magnificent menu crafted by world-renowned Peruvian Chef Diego Muñoz. Throw in a 25-metre pool, music recording studio, restaurant, bar and art space, and you’ve got one seriously cool hangout spot. Head down from 4pm and check out their daily DJ lineup – a rotating cache of local and international dudes who know just how to serenade that sunset. A little bit beachy, a little bit boozy, big on the music and even bigger on the food – SugarSand is the perfect mishmash of everything we love: superb cuisine, expert cocktails, a killer bill of live music, and plenty of nods to local art, design and culture. Set across two-levels with unobstructed ocean views, SugarSand is kitted out with poolside daybeds, a toes-in-the-sand beach bar and seaside terrace serving coastal bites and cocktails. 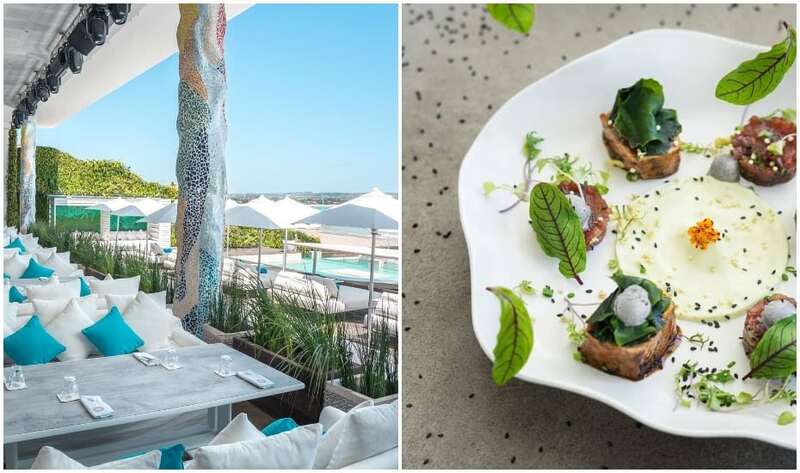 By day, graze on the Japanese Nikkei-inspired menu (try the zesty ceviche and tiraditos) and by night, head to the open-air rooftop lounge that just begs for nightly sundowners beneath candy-coloured skies. If it’s five star apres-surf vibes you’re after, then Komune Beach Club is the one! Komune Beach Club, Jl Pantai Keramas, Keramas, p. +62 361 301 8888, e. reservations.bali@komuneresorts.com. Break out the superlatives for this hidden paradise nestled at the bottom of south Bali’s dramatic sea cliffs. A boutique beach club with the whitest sand, bluest water and tropical-est of vibes (yeah we just made that word up), Karma Beach is quite simply stunning. Our insider tip is to get there by mid morning to secure your spot on one of their sun beds or beanbags, then just lounge the day away in five star fashion. Splash in the lagoon, hop on a SUP then take a walk on the pristine beach before washing off the sand at the Karma Spa for a divine treatment or two. Pure bliss. Karma Beach Bali, Karma Kandara Resort, Jl Villa Kandara, Banjar Wijaya Kusuma, Ungasan, p. +62 361 848 2222, e. reservations@karmabeach.com. Overlooking Dreamland beach and with jaw-dropping views all the way out to Uluwatu, El Kabron has become something of a pilgrimage for savvy sunset worshippers who know that this is one of the best spots to watch the end-of-day show. The emphasis here really is on afternoon poolside grazing, sunset tipples and smart casual dinners that roll on towards midnight. Make your friends green with envy with a cheeky Insta snap in their iconic infinity pool, with the Indian Ocean as a backdrop and a mandatory glass of Sangria, naturally. El Kabron, Jl Pantai Cemongkak, Bingin, p. +62 85 100 803 416, e. info@elkabron.com. Open daily from lunch til late. This one’s for the A-listers and eco-conscious luxury lovers. 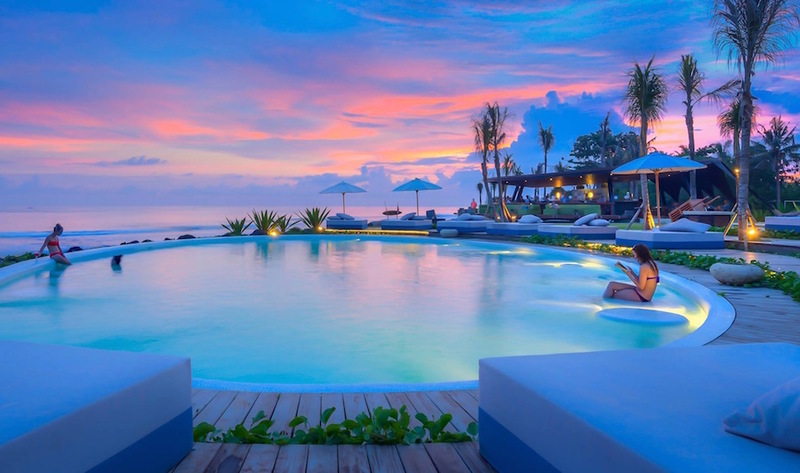 COMO Beach Club is an exclusive destination from one of Bali’s most progressive resort brands, set amongst the stylish grounds of COMO Uma Canggu. This five-star Nirvana is just built for wining, dining and sunshine soaking in style, with everything we love about COMO locations Asia-wide: the fabulously sustainable designs, impeccable service, fresh local ingredients and of course, feel-good vibes all around. COMO Beach Club at COMO Uma Canggu, Jl Pantai Batu Mejan, Echo Beach, Canggu, p. +62 361 302 2228 e. como.uma.canggu@comohotels.com. 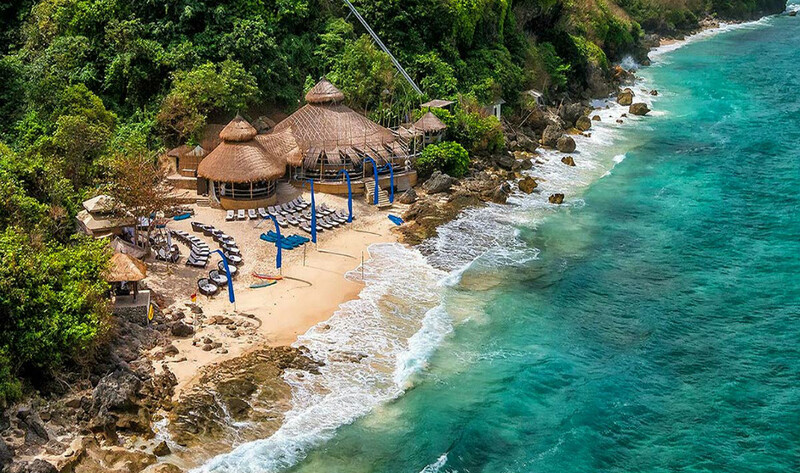 Quirky, fun and playful, Roosterfish is the only beach club that’s made a home on Bali’s famous Pandawa Beach – a shimmering stretch of white sand at the base of a dramatically-carved cliff. 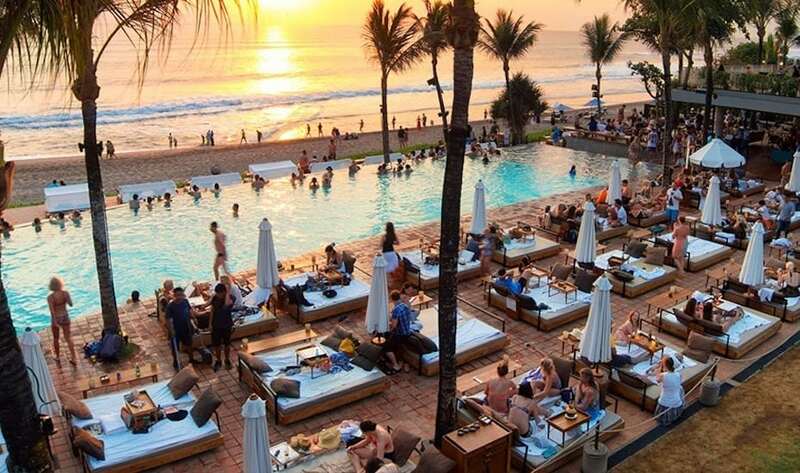 It’s the house beach club of Renaissance Bali Uluwatu, situated 10 minutes from the resort with a free shuttle bus for in-house guests. Once you’re down on the sand, it’s a fabulous fusion of both land and sea (hence the name, Roosterfish) with fresh ingredients finding their way into the wood-fired pizzas, grilled seafood and oversized icy cocktails from the swim-up pool bar. Settle in for a day of smokey barbecues and signature Bloody Scary Mary’s, or just soak it all up from one of the floating bean bags. Roosterfish, Jl Pantai Pandawa p. +62 811 3960 9781, e. info@roosterfishbeachclub.com. Open daily 10am – 7pm. 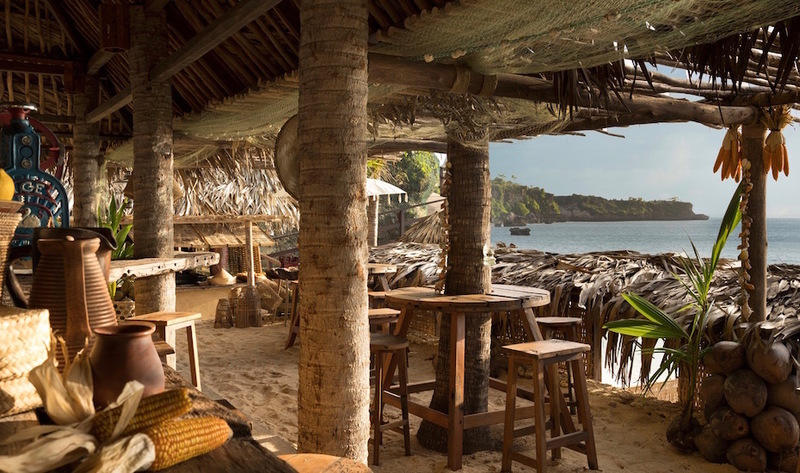 Come for the daytime vibes, stay for the sunset sessions – Ohana’s has luxed up our Lembongan trips! Thanks to Ohana’s, island getaways to Nusa Lembongan have luxed up a notch. 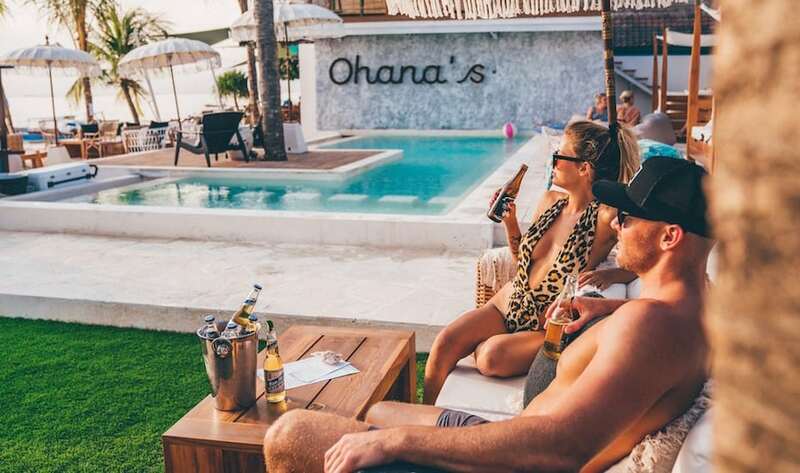 Ohana’s is “Lembo’s” beachfront destination that’s raised the bar for beach clubbing on Bali’s “little sister” island. 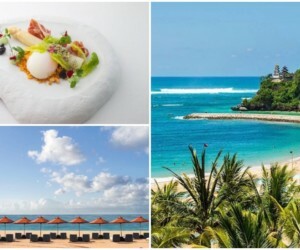 A beachfront pool teeters on the edge of crystal clear waters, while small bites, seafood and salads are served up under breezy umbrellas and bright-white daybeds. Come early for the daytime vibes, stay for the sunset sessions, and stick around until after dark for dinner on the upper deck beneath the stars. And psst, it’s two-for-one cocktails every day from 3-6pm! Ohana’s, Jungut Batu Beach, Gg. Nusa Indah, Nusa Lembongan, p. +62 811 3960 0787, e. hello@ohanas.co. Open daily 7am – 11.30pm. There’s countless cosy and breezy nooks at Azul Beach Club to eat and drink your Bali days away! 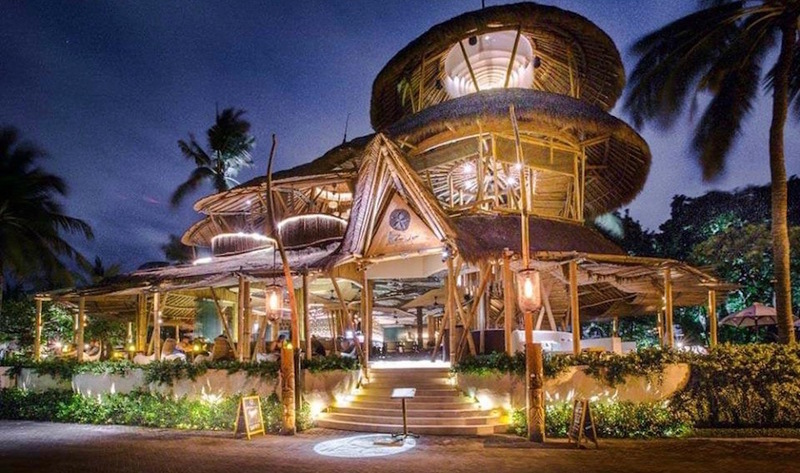 Overlooking the sands of Padma Beach in Legian, this sprawling bamboo tree-house has cosy, breezy nooks all over the place to eat, drink and be merry across its three floors. The mid-level al fresco bar is the epitome of tropical cool, with its balcony seating bays, eye-catching bar motifs and comfy furnishings. For daytime hangs, head out the back to grab a lounger and soak up the sun around the pool, while down on the ground floor sits the crown jewel – Azul’s casually chic restaurant with Bali’s first Tiki Bar. Cheers! Azul Beach Club, Jl Padma No.2, Legian, Kuta, p. +62 361 765 759, e. info@azulbali.com. Say “hola” to island heaven at Ibiza in Bali! The island’s first Mediterranean-Ibiza style beach club, Ibiza in Bali brings European vibes, Balearic beats, Spanish cuisine and a whole lotta style to Jimbaran’s beachfront. Set on a beautiful white sand bay, Ibiza in Bali is centred by a gorgeous glass aquarium pool with a swim-up bar, and is fringed by plush daybeds and a rooftop lounge with a bubbling Jacuzzi. 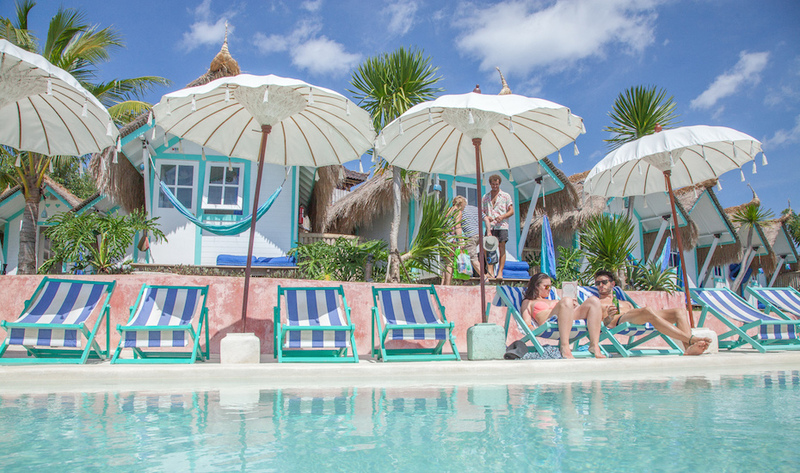 Bring your bikini, a big appetite and say “hola” to island heaven! Ibiza in Bali, Jl Pantai Kelan, Jimbaran Bay, p. +6281238171777, e. hola@ibizainbali.com. Open daily 12pm – 8pm. 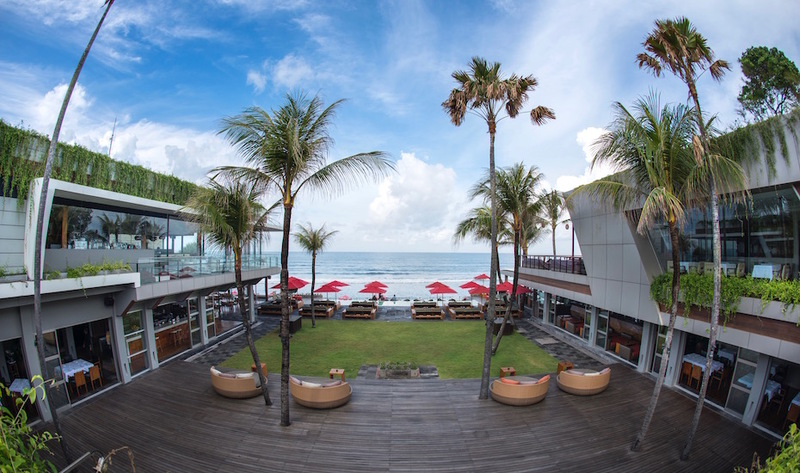 It’s no longer sleepy Sanur thanks to the opening of ABC Artotel Beach Club! Sleepy Sanur? Not anymore. 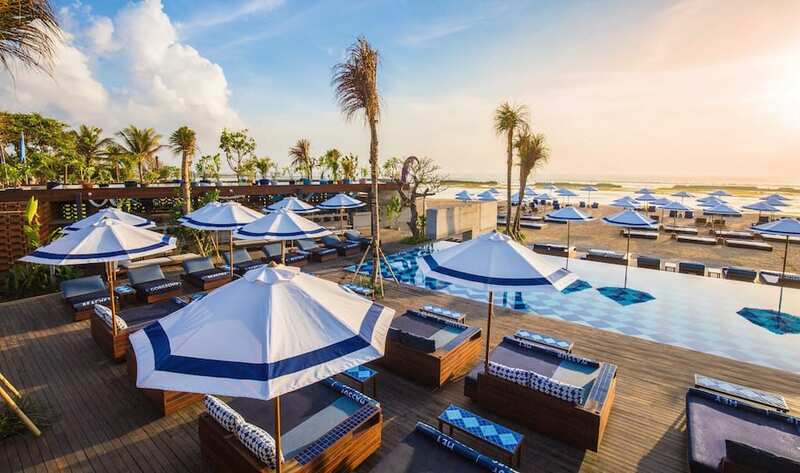 Artotel Beach Club (ABC) has ramped up Sanur’s rep with one of the hottest beach clubs on the island. Its nifty, internationally-acclaimed design is the work of the superstar architects behind Nihiwatu (swoon!) 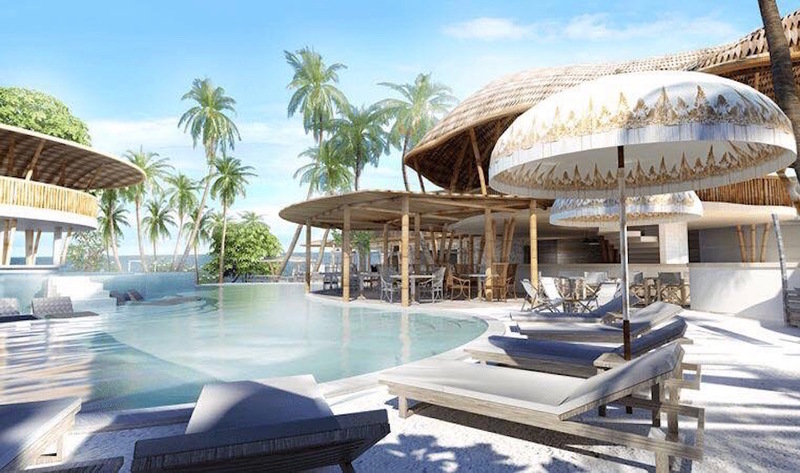 and Finns Beach Club, featuring a signature giant bamboo tree house built around a hundred year-old Banyan Tree, a manicured lawn and absolute beachfront views in a stunning 7000 square-metre space. Lounge poolside with a cocktail in hand from one of four fabulous bars, and graze the day away on ABC’s seaside staples. Artotel Beach Club, Jl Danau Tamblingan No.35 Sanur, p. +62 361 4491888, e. reservation@artotelbeachclub.com. 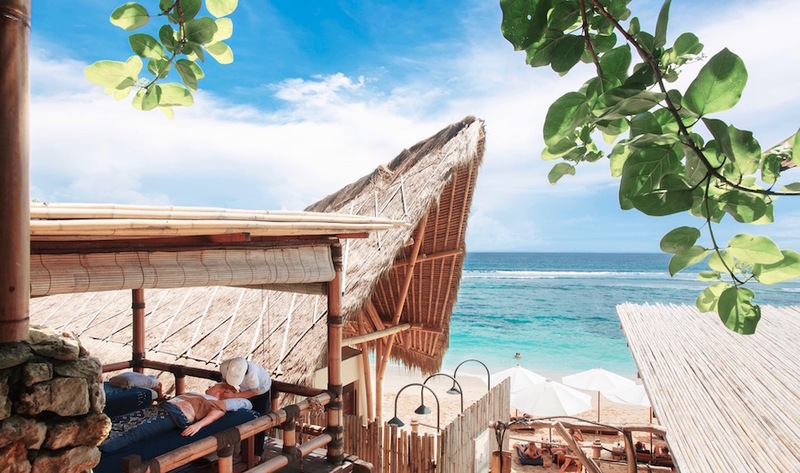 Located on the tiny island of Nusa Ceningan – just across the famous yellow bridge to Lembongan – Le Pirate is one of Bali’s best-kept secrets. Whether it’s daytime lounging by the pool surrounded by turquoise ocean and swaying coconut trees, or settling in for another spectacular sunset across the lagoon, no adventure around the island is complete without stopping in to Le Pirate. Island hoppers should also check out Le Pirate’s other locations on the famous Gili T, and in the up-and-coming hotspot of Labuan Bajo in Flores. Le Pirate, Nusa Ceningan, Lembongan, Bali, p. +62 361 733 493, e. contact@lepirate.com. Accessible via a private cliff-inclinator, AYANA resort’s very own castaway beach club is a hidden paradise of powder white sand, calm turquoise waters and cocktails to die for. 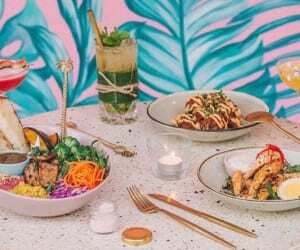 Bamboo-boho chic with a vintage Bali vibe, our hot tip here is to check out the retro arak cocktails and settle in for a sublime massage under a coconut tree, or check out some of the fab local style food like oxtail soup and grilled satay. *Note, the beach club is only open to in-house guests of AYANA, so you’ll have to check in before you can check it out! Kubu at AYANA, Jl Karang Mas Sejahtera, Jimbaran, p. +62 361 702 222, e. info@ayanaresort.com. Splash out on a VIP Cabana at Cocoon for a day you won’t forget! A chic mix of casual fine dining, funky music and luscious lounging, Cocoon is truly a multi-purpose club offering something for everyone depending on the time of day or night you happen to drop by. A relaxed and informal enclave for poolside wining, dining and grazing during the day, Cocoon transforms itself into an atmospheric dining venue in the evening, with stylish décor and flickering candles creating an ambiance that is perfectly complemented by the sensational Asian / Mediterranean style menu. Cocoon Beach Club, Jl Double Six, No. 66 Blue Ocean Boulevard, Seminyak, p. +62 361 731 266, e. info@cocoon-beach.com. Relax, recline and unwind at S.K.A.I! Concealed deep in the heart of the five-star Padma Resort, S.K.A.I. ticks all the boxes for a spot of beach club lounging. Relax, recline and unwind whilst sampling the beachy menu and super refreshing drinks. 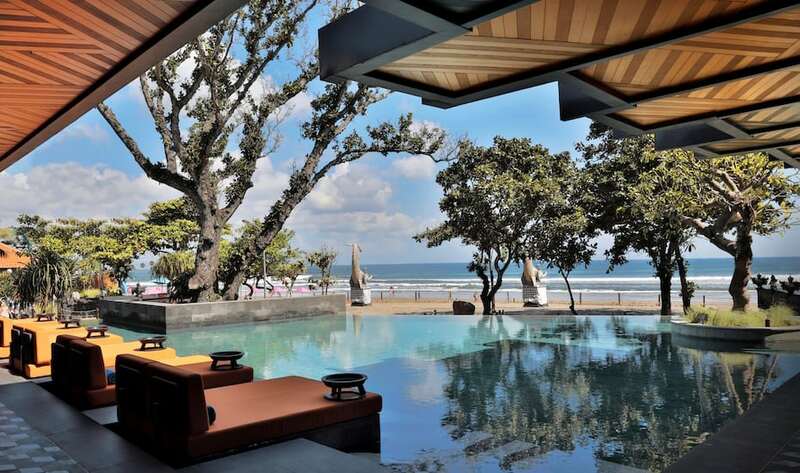 Top up the tan in the outdoor lounge area, or give your sun-kissed skin a break in the infinity pool, which offers gorgeous views all the way along Legian Beach. S.K.A.I. at Padma Resort Legian, Jl Padma No.1, Kuta, p. +62 361 752 111, e. reservation.legian@padmahotels.com.